Actually this article is not really a history of What’s Brewing. If it were, it might surprise you how long that would get. One day we might (will) do that. But for now, we’re providing a few excerpts including a couple that were originally published on websites belonging to CAMRA BC and CAMRA Vancouver, plus articles from our archives. For those interested, they provide a peek into the history of BC’s first and longest-running beer enthusiast publication. Recently, CAMRA Vancouver president David Perry’s monthly Update featured the two gents who took it upon themselves to resurrect WB in 2015. Here’s the lead-in excerpt and link from CAMRA Van’s December 2015 e-newsletter. 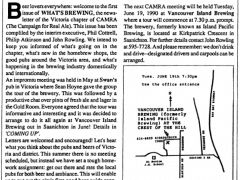 With the influx of new members CAMRA Vancouver has seen in the last few years, it seemed fitting to take some time to touch on the history of CAMRA in Vancouver. I recently had the chance to sit down with long-time members Paul Morris and Dave Smith to delve into the history of how our branch started. I also learned about how they got involved with craft beer newsletter What’s Brewing and eventually evolved it into an online magazine. Click here to learn more about CAMRA Vancouver’s past, and find out how Dave and Paul are running with an idea that’s different than most things we are seeing in the craft beer community. John is a pioneer in the BC beer scene, known for his involvement in the founding of CAMRA BC/CAMRA Victoria, as well for his role in Great Canadian Beer Festival, his writing, and much more. Here are a couple of tidbits from John. We’ve come a long way since April 7, 1990 when seven of us sat down at Spinnakers and decided we would get CAMRA going. The next meeting was in May at Swans in the Gold Room (now the Collard Room). Everybody chipped in a dollar to cover newsletter mailing costs! We were written up in Monday Magazine, so in June when the meeting was held at Vancouver Island Brewing (on Keating Crossroad) some 70 people showed up and we were away. That summer we decided to ask for dues to cover CAMRA’s costs. Having done that, we went to open a bank account, only to find that we needed to be an incorporated society. So the “Campaign For Real Ale Society of British Columbia” was officially incorporated on September 24th 1990. This month then is the 25th Anniversary of CAMRA as an incorporated society in BC. I would like to thank Ian Lloyd for editing What’s Brewing last year, and now Dave Smith for keeping What’s Brewing alive. It seems so different to the single newssheet that we mailed out to the 30 or so members that we had 25 years ago. Welcome back, What’s Brewing! For the first few years of CAMRA Victoria … distributed free (paper) copies at Spinnakers, Hugos, Swans, Canoe and Vancouver Id Brewing. We successfully recruited new members this way. We were following CAMRA UK, as branch newsletters are available in all good pubs in Britain. – Originally fetched from http://camrabc.ca/whats-brewing/current-magazine (September 27th 2011, now offline). 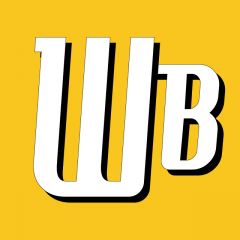 Phil is the original editor of What’s Brewing in BC, and will always be thought of by many (including the current editorial team) as synonymous with WB. Here are some thoughts from Phil. We have come a long way since the days when your choice of beer was take-it-or-leave-it flavourless sub-arctic fizz. What’s Brewing has been there through the entire journey, from its first edition as a photocopied two-sided piece of paper to the iteration you are reading right now. I hope you will become part of the tradition, subscribe and enjoy What’s Brewing, and I hope you will feel comfortable enough to comment on the articles and perhaps even write something yourself. Welcome home. Any past history of What’s Brewing in BC is also necessarily history of CAMRA BC. If you’re not aware of the Society’s origins, make yourself familiar here. (By the way, if you’re not already a member, you should consider altering that situation). It was born in the summer of 1985, at a meeting of CAMRA Canada’s Vancouver Chapter at the Rowing Club in StanleyPark. That day was special from the start for me, travelling as I was from Victoria to attend my first CAMRA meeting with people I had only met previously via mail. The folded-paper-in-an-envelope kind that you stuck a stamp on and dropped into a mail box. There was a sporadic newsletter from Ottawa back then, but it never mentioned B.C. and we never met any of the members from back east, or from anywhere else in Canada for that matter. Now that you’ve heard about the original 2-sheet issue from John and Phil, you might care to see it. Here it is. previous post: What the Heck is “Mild”?